On 2 April 1898 Diepenbrock came into the possession of the Ausgewählte Schriften (Selected Writings) of Clemens Brentano (1778-1842), an exponent of German early Romanticism. Exactly two weeks later he composed Lied der Spinnerin (Song of the Spinner) on a poem from part I of the edition Aus der Chronika eines fahrenden Schülers (From The Chronicles of a Travelling Student, published in 1818). Brentano situated this novella in the Middle Ages. A roaming beggar student tells stories accompanied by several ‘folk ballads’, like Brentano’s Der Spinnerin Nachtlied (The Night Song of the Spinner, c. 1800). In the light of the moon a woman sits all alone at her spinning wheel. Over and over again the song of the nightingale evokes memories of the long bygone happy years she had with her deceased lover. The bird song brings both rapture and profound sorrow. Already as a child Diepenbrock had often heard about Brentano during visits to his grandfather Bernard in Bocholt, as Brentano was a friend of Bernard’s brother, Mgr. Melchior Diepenbrock (1798-1853), bishop of Breslau. Melchior, himself also a poet, greatly admired Des Knaben Wunderhorn (The Boy’s Magic Horn), a collection of folk poems Brentano had published together with Achim von Arnim. Thus, Alphons had become familiar with these literary works from an early age. In his setting of Lied der Spinnerin Diepenbrock wanted to reflect the simple strophic character of Brentano’s text. The programme notes for the first performance of the orchestrated version (RC 75), which – though unsigned – were apparently by Diepenbrock, say: The song is constructed from two themes, with strophic repeats, like a folk song. (BD V:702) The character indication at the beginning of the vocal part reads dolce e semplice. Diepenbrock placed the accompaniment in the middle and high register of the piano (he does not go below g in the small octave) and the dynamics are pp almost throughout. 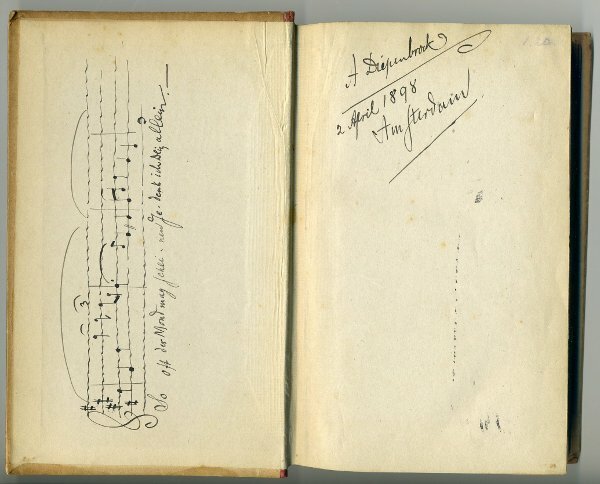 Strikingly, in manuscript A-41(5) Diepenbrock added Streichquartett (String Quartet) in brackets to the indication Pianoforte at the beginning of the system of the piano part. Diepenbrock dedicated the song to Aaltje Noordewier-Reddingius, who performed it for the first time in the Recital Hall of the Amsterdam Concertgebouw already that same month, on 30 April 1898. 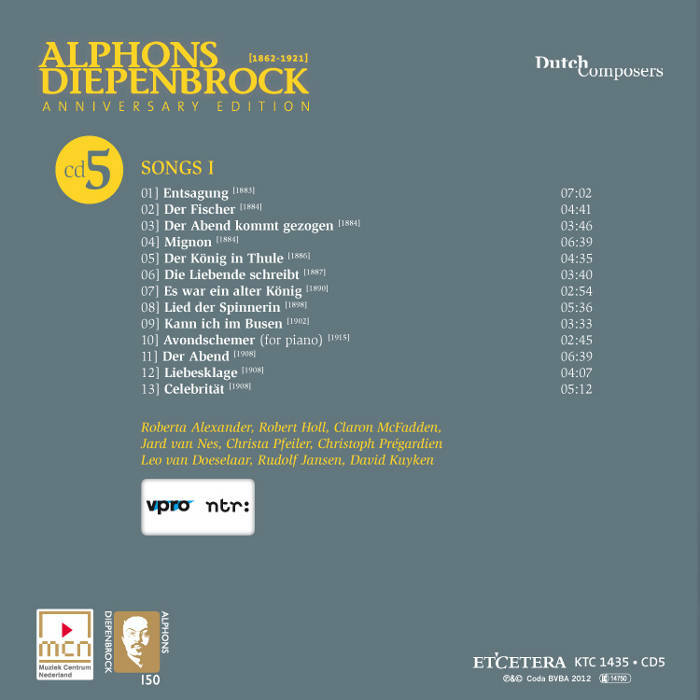 At that memorable soirée she premiered six more songs by Diepenbrock, including Die Liebende schreibt (The Lover Writes, RC 20) and Hinüber wall’ ich (I Pilgrimage Over There, RC 37), which were also dedicated to her. Lied der Spinnerin is one of the eleven songs published by A.A. Noske in October 1905. 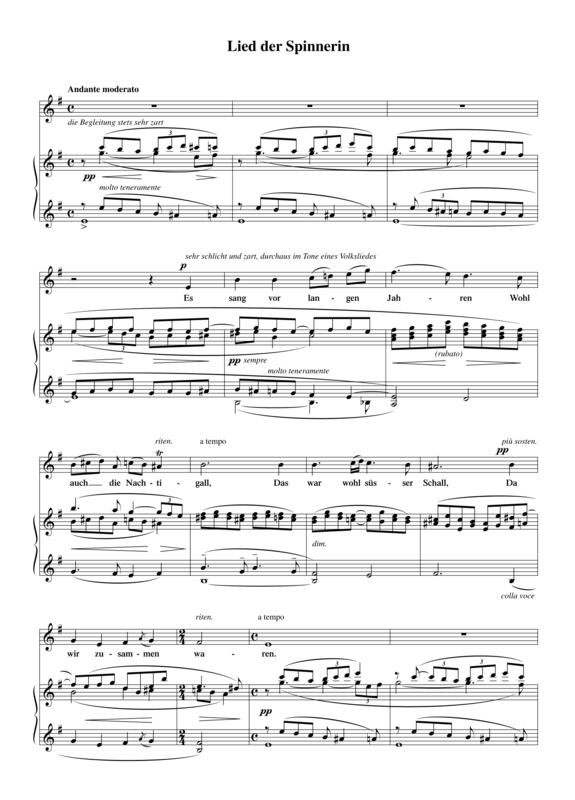 When preparing this composition for print, Diepenbrock added general performance directions for the singer and pianist, respectively Sehr schlicht und zart, durchaus im Tone eines Volksliedes (Very simple and soft, in the tone of a folk song throughout ) and Die Begleitung stets sehr zart (The accompaniment very soft throughout). The suggestive direction Streichquartett has been indicated in the edition as: quasi Vlni con sordini (like violins con sordino). After Aaltje Noordewier had performed the song again in the autumn of 1906 at a concert in Rotterdam, Diepenbrock decided to orchestrate it for her. In 1908 Diepenbrock was to set Brentano’s poem Der Abend (The Evening) to music as well (see RC 88-90). Illustration: On the inside of the cover of Ausgewählte Schriften von Clemens Brentano Diepenbrock noted the musical phrase “So oft der Mond mag scheinen Gedenk ich Dein allein” (Whenever the moon cares to shine, I remember you alone) from his Lied der Spinnerin.